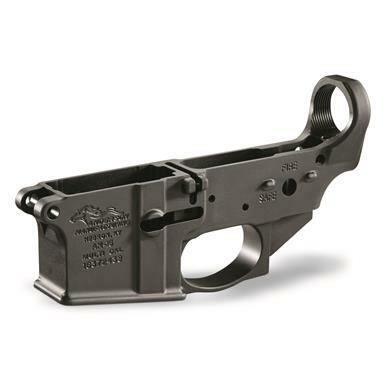 Bring your dream rifle to life with this Anderson® Stripped AR-15 A3 Lower with Closed Trigger. Built to mil-specs and and precision machined to ensure drop-in installation of mil-spec aftermarket components, this Anderson® Lower features exceptional fit and finish that will meet and exceed your expectations. Dimensions: 8" x 1.75" x 4.5"
Anderson Stripped AR-15 A3 Lower Receiver, Closed Trigger is rated 4.9 out of 5 by 20. Rated 5 out of 5 by BigGuy from Quick ship,and works well. Rated 5 out of 5 by Dave111 from Great lower, easy installation of Kit Was easy to install lower kit and upper works great. Rated 5 out of 5 by Greg86 from Great price Awesome lower. Also love the fixed trigger guard. Rated 5 out of 5 by Anonymous from Great price and quality! I paired this stripped lower with Palmetto State Armory components. Assembly went better than expected. (I didn’t have a block vise) This was my first ever AR build, and I’m very satisfied so far with how everything functions. I would definitely recommend this! Rated 4 out of 5 by tiptopdaddy from Good quality, good price but had one slight issue I bought this piece for my first AR build using a PSA pistol kit. I had no issues at all with assembly other that than the fitment of the bolt release lever. It sticks a little bit but seems to be loosening up after lubrication and cycling. If I were to do it over again I would have polished the mating surfaces for less interference OR went with an Anderson lower kit. Otherwise, everything else went together very nicely, quick delivery from SG to my FFL and I'm stoked on my build. Rated 5 out of 5 by badgerone from Excellent Mil Spec lower for a bargain price. I have come to think of Andersen as a benchmark, or gold standard of high-quality. Don’t let the affordable price fool you, these are high-quality ARs and every bit as good as more well-known name brands. Rated 5 out of 5 by Richard from Nice ! I bought 3 of these and I am going to buy more ! Perfect fit and finish,and I love the closed trigger guard. It is one less step in assembling your lower,and it looks sharp ! Where else can you get a billet lower for under 50 dollars ? I put 2 together with Palmetto kits,and I had myself 2 solid AR's for less than $350 each ! Both kits went together perfect,and shoot great ! Why would you pay all that extra money,just to have an AR that said Colt or Armalite on the side of it ? People are really missing the boat on these,this is a rock solid start to a solid AR build ! APF Tactical Varmint, Semi-automatic, .223 Wylde, 18"
Show those varmints who's boss. Bushmaster XM-15 Optic Ready Carbine AR-15, Semi-Automatic, 5.56 NATO/.223 Rem, 16&quot; Barrel,30+1 Rds. Power and performance for your shooting enjoyment. Bushmaster XM-15 Optic Ready Carbine AR-15, Semi-Automatic, 5.56 NATO/.223 Rem, 16" Barrel,30+1 Rds. Compact size, rugged military carbine features, and .308 firepower!